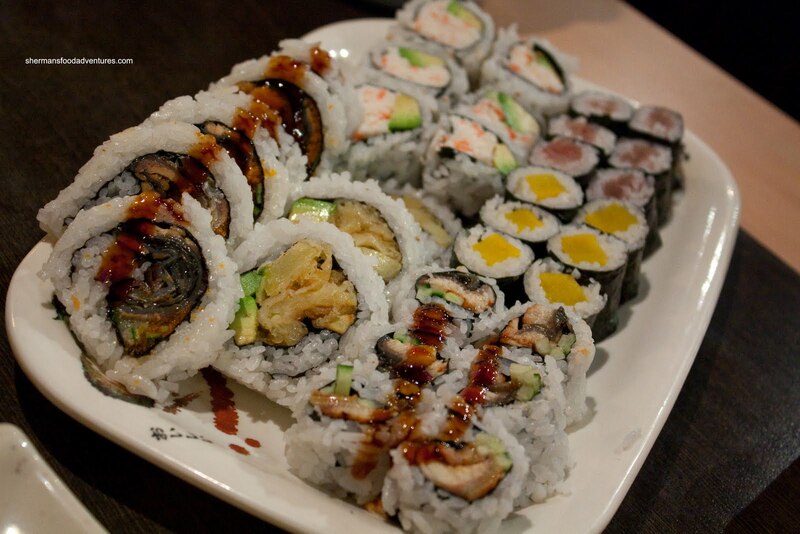 All-you-can-eat Sushi. Aiya. I knew we were asking for it. More often than not, this type of Japanese cuisine (if you can even call it that) is an exercise in disappointment. Just look at places such as Kawawa, Sui Sha Ya and Kisha Poppo. Definitely quantity over quality. To be fair, there are some acceptable places such as Ninkazu and Tomokazu. It was not our intention to go for AYCE sushi after Monday night softball. 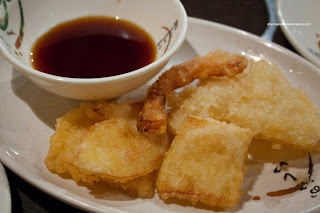 Our original plan was to try out Kingyo's latest venture - Suika. I did my due diligence and made sure it was open on Monday nights. Yet, as we pulled up to the place on Broadway, it was *gasp* closed! Turns out of all the Mondays, we had to pick the one they were closed for a "staff meeting". WTF? So as a backup plan, we headed to Toyama for their late night AYCE. Hey, how bad can it be? They do claim to be "Vancouver's best sushi" in all their ads on the Beat 94.5. If you are snickering right now, I don't blame you. When one hear such claims, it is almost an invitation for ridicule. At the very least, everything started off fine as we got rock star parking right in front of the place along Seymour. To top it all off, it was free too! The restaurant is not very big and the seating is a bit tight. But that is to be expected with a Downtown location. As mentioned, we made it for their late night AYCE for $13.95. For $1.00 more per person, we could've have sashimi included (limit to 6 pcs per person). That is a pretty reasonable price tag for that addition. We didn't end up getting it and instead started with the Nigiri. With this, we could still get a taste of their raw fish. For once, the rice to fish ratio was good. Mind you, there was very little fish too. The slices were razor thin. 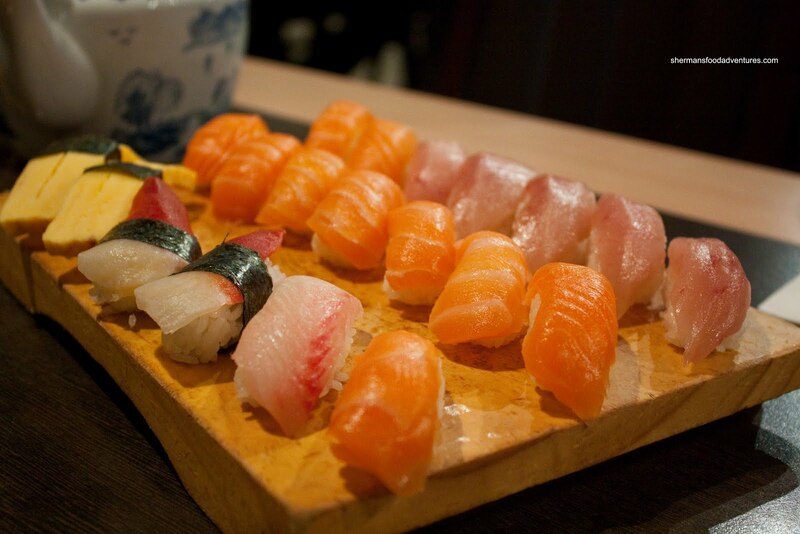 If we could rate the different fish (salmon, tai and tuna) as one, the consensus was "okay". Nothing particularly wrong while nothing particularly memorable as well. The rice itself was on the drier side and a bit too vinegary. We also got a variety of Maki Sushi including BC Roll, California Roll, Yam Tempura Roll, Unagi Roll, Tuna Roll and Oshinko. If we had to group them into one again, the best way to describe these rolls would be "typical Japanese fast food sushi". That is not a criticism per se; rather than an observation. Not horrible while not great either. It filled our tummies. 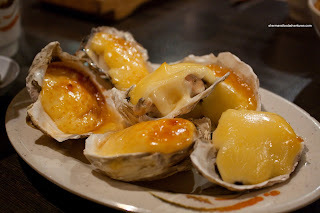 Interestingly, there were several options for Motoyaki including oyster, f ish and scallop. We went for the oyster and scallop; but they put it all on one plate. With everything looking the same, it was a guessing game as to what we would be eating. Now, the scallops and oysters were okay; however, as you can clearly see, the motoyaki was not really all that broiled. Thus, it was essentially a lukewarm mayo-concoction that was not all that appealing. On the topic of unappealing, the Gyozas were very inconsistent. 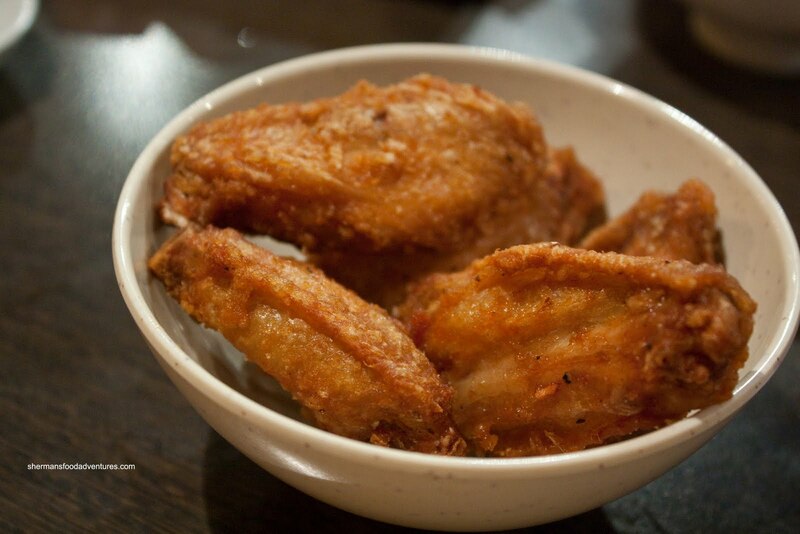 As you can clearly see, they were all fried up in the same pan or flattop; yet each one had a different texture. These premade gyozas were actually alright with a decent pork & veg gie filling. 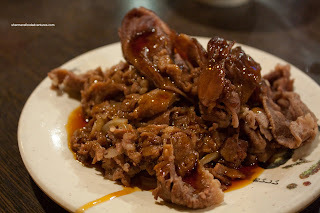 However, some had dumpling skin that was tougher than shoe leather which rendered them inedible. Then surprisingly, some were perfectly cooked. 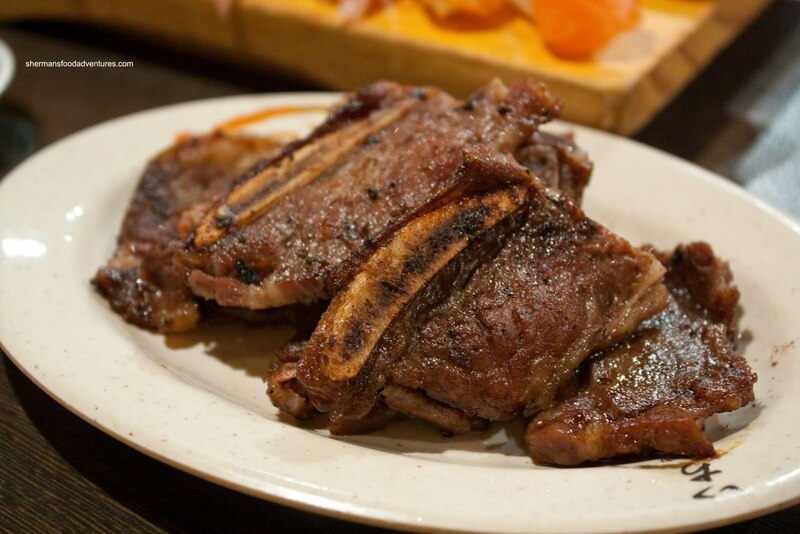 Hands down, Beef Short Ribs are Bear's favourite food. So it is not a stretch for him to eat a whole serving by himself. Hence, we marked down 25 pieces on the checklist. What you see in the picture is how much we got. Rather than 25, we received 8. Um, how does 25 become 8??? Yes, I do realize that some AYCE joints do the same trick, namely Fish on Rice. C'mon. Honestly. 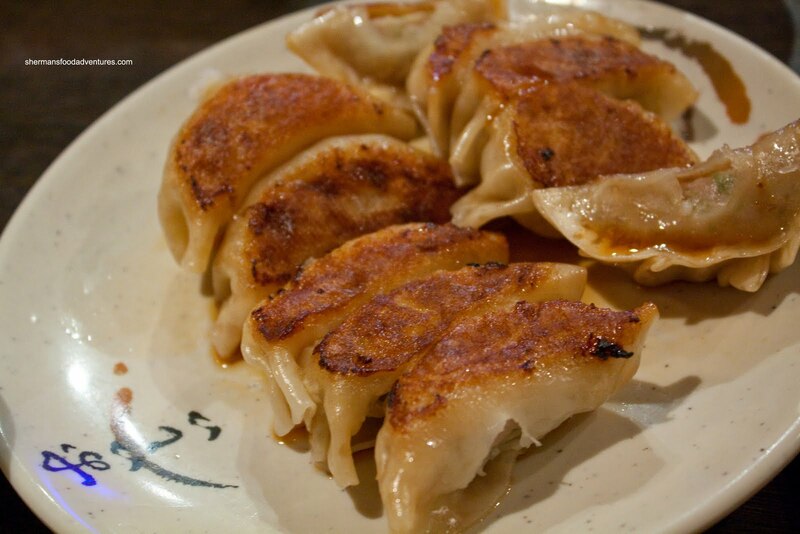 Lo ok at the gyoza. We ordered 10, we got 10. So obviously they can count. So what's the deal on the short ribs? If you don't want to give people what they asked for, why offer it? I mean, they have this "no wasting" policy already. What's the harm? I truly think that this tactic is unethical. Oh, and as for the short ribs, they were chewy and too salty. And for our second order, we wrote down 50 and got 16. So obviously, the count by 8's with the ribs. Must be some kinda foreign math. Now here is where the thought of Kawawa slowly creeps int o the meal. 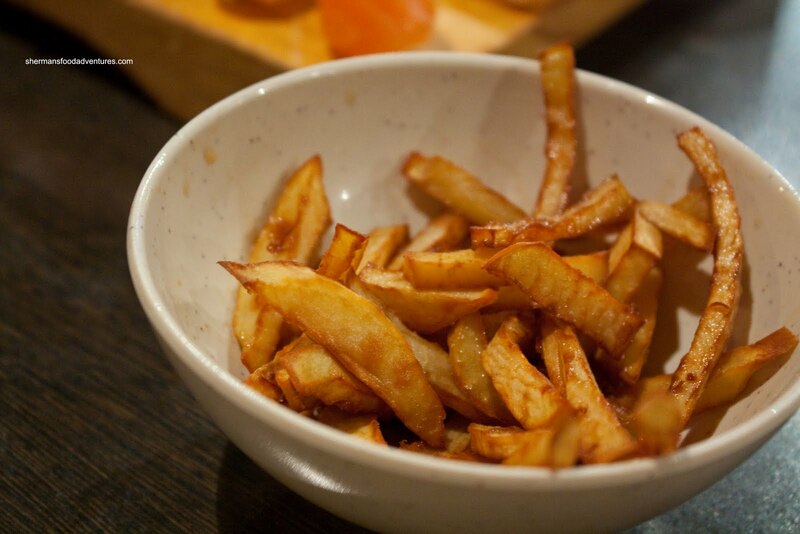 The Yam Fries were not like any yam fries we've ever had. These things were cut up into little slivers and then flash fried I would assume. But these came out more limp than someone who ran out of Viagra. Oil-logged and showing no cooking technique whatsoever, this was terrible. Oh it gets worse! 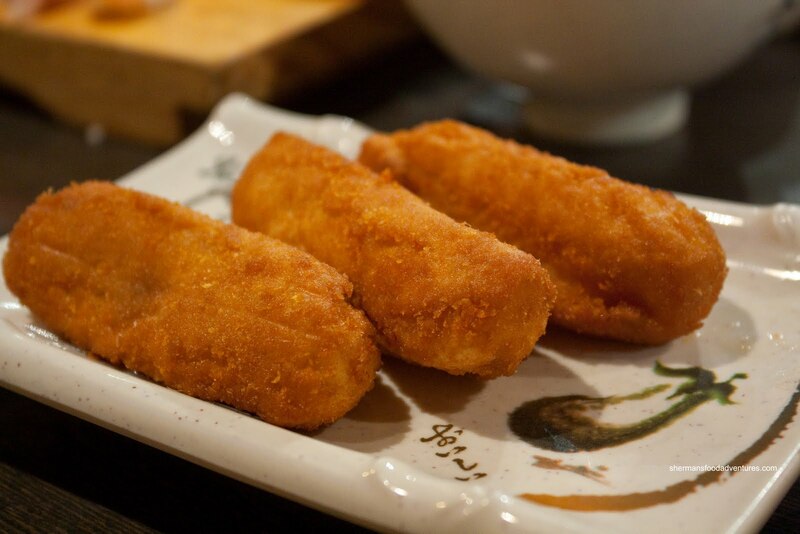 The Croquettes were a complete surprise to us all. Normally, it is filled with potato or pumpkin or something like that, especially when they are fried up in the way they appear in the picture. What was really inside was some dense, sweet mochi. Okay, there is a mochi croquette out there; but it doesn't look like this. Then it only gets worse with beef jerky masquerading as Beef Teriyaki. The thinly-sliced meat was so overcooked and dry, it began taking on properties of Jimmy's Beef Jerky. Factor in the powerful sweet and salty sauce, it was actually more of a beef jerky than anything. Moving along to the Chicken Karaage, it didn't get much better. They were overfried which made the meat hard and a bit greasy tasting. The skin was no longer crispy; rather, it was dried out and was not pleasant to eat. At the very least, there was enough seasoning. Okay, onto something that was actually quite good. 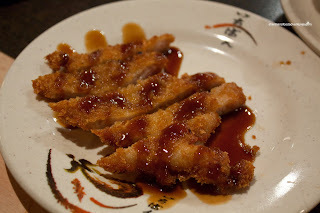 The Tonkatsu was fried up perfectly crisp on the outside while still being moist and tender on the inside. There just enough sauce to flavour the pork chop without drowning it. We ordered this twice since it was pretty good. However, on our second order, we marked down 2 and ended up with the same amount as our first order, which was 1. It appears their abacus was broken. So 1 pork chop is equivalent to 2 pork chops... Sounds like the Government here with the HST. Anyways, another fried item that was half-decent was the Tempura. Consisting mainly of yam and sweet potato, there was this one piece of squash? Not sure what it was. It just looked strange. Whatever, the batter was not too heavy and turned out crispy. Not much more to be said about it. We had a few more things that were not really worth discussing. They were neither great or terrible. 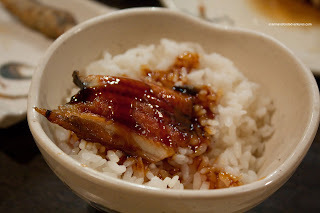 However, the last thing worth mentioning was the Unagi Rice. Milhouse and I both decided to get an order despite it violating the AYCE "maximum benefit" rules. You see, it is a bowl of rice and it fills you up while not being worth all that much. We took a gamble because the last few times we have ordered it in an AYCE setting, it was not too big and had a good rice-to-unagi ratio. When it arrived here, we were really sorry that we even tried. There was a full bowl of rice and a measly piece of unagi. Heck, there wasn't even enough sauce to flavour all of the rice. Serves us right though. We should've never have ordered it. To be fair, they didn't charge us for leaving half of the bowl of rice untouched. If they had, we would've been very P.O.'d. That pretty much summed up everyone's sentiment about the food here. 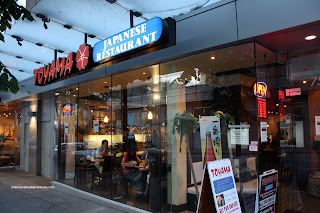 For a place that boasts in their ads that they serve some of Vancouver's best sushi, it cannot be more further from the truth. Again, to be fair, the food is not inedible. But compared to even the local hole-in-the-wall Japanese restaurant, the food we had was sub-par. Sure, it was in an AYCE format, which could be the reason why it was not that great. Maybe their a la carte is better. Maybe someone can confirm or deny this. All we can say is to avoid the AYCE. There is much better to be had in the GVRD.